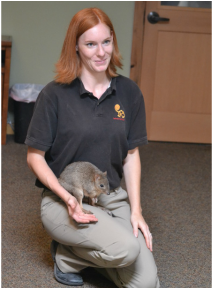 Sydney - Animal Wonders Inc.
Sydney was the 5th bettong joey born at Animal Wonders. We had an amazing breeding pair, Quigley and Babette, who were wonderful parents and produced healthy friendly joeys. After 4 years we made the difficult decision to send Quigley and Babette to a larger facility who could better manage the captive breeding program of this critically endangered species. We decided to keep Sydney so that we could continue to spread knowledge and awareness of this amazing species! Sydney is an incredible ambassador. She allows audience members to interact with her and gently licks their finger and waits for a treat. Her favorite treat is cashew, but she also enjoys yams, cabbage, and mushrooms along with her staple kangaroo diet.